View cart “Backstage with Jeanette” has been added to your cart. Jeanette’s third book challenges you to explore your current beliefs about yourself, your abilities and this ‘world’ we experience. A series of exercises lead you on a journey of self discovery and into an expanded sense of self. Have you ever known who was going to be on the phone before you answered it? Have you ever though of someone you had not seen in years and then bumped into them? Have you ever known that a particular bill or letter was going to arrive that day in the post? These kinds of events are evidence of a latent psychic ability. Do you dare to explore and expand these abilities? As seen in the television series DARE TO BELIEVE, medium Jeanette Wilson has spent more than 20 years connecting people with their loved ones in the spiritual dimensions. In this book she shares the secrets of her own gifts and challenges you to see the world and your place in it with new eyes. By developing new abilities, you can receive your own higher guidance and talk at will with loved ones who have passed over. 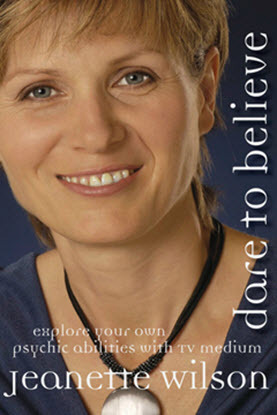 Brimming with insights and exercises, DARE TO BELIEVE challenges you to let go of your limited sense of self and discover more about the spiritual dimensions and about yourself.